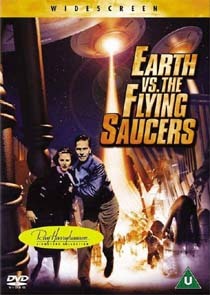 Earth Vs The Flying Saucers is one of the seminal pulp science fiction movies of the 50s. It’s perhaps not as well regarded as movies like The Day The Earth Stood Still or Invasion of the Body Snatchers, but for sheer entertainment value, it’s hard to beat. The film’s chief asset is its hokey special effects, which were created by the peerless Ray Harryhausen. Long before the aliens in Independence Day and Mars Attacks! laid waste to America’s treasured national monuments, Ray was busy destroying Washington D.C.! The film is presented in widescreen ratio of 1.78:1. It’s certainly not a completely accurate representation of its original theatrical presentation, but the framing looks okay. The film obviously had a modest budget, and this is reflected in the transfer. The film features a lot of stock footage, some of it in very poor condition, and the techniques Harryhausen used had the unfortunate side effect of increasing film grain, so it’s not surprising that the film looks rather rough in spots. It’s a good transfer, though, and only a lot of restoration work would be likely to improve it. The mono audio (at 192kbps) is a bit scratchy, but no worse than is entirely reasonable. The disc comes with one unique extra: an eight-minute interview with Harryhausen about the film, conducted by director Joe Dante. With the help of a couple of the original models used in the film, Harryhausen explains some of the techniques he used. The disc also contains the hour-long Harryhausen Chronicles and This is Dynamation (3m) documentaries, which have featured on most of Columbia’s Harryhausen discs, including First Men in the Moon. A breathless 4:3 theatrical trailer is also offered, as well as a modest gallery of photo’s and posters.